The first time I ever saw The Madera Strand they played and entire set of Police covers for a Cover The Crescent event, since that time I have watched them grow into their own, memorized their first EP and they have subconsciously become one of my favorite bands to catch live. 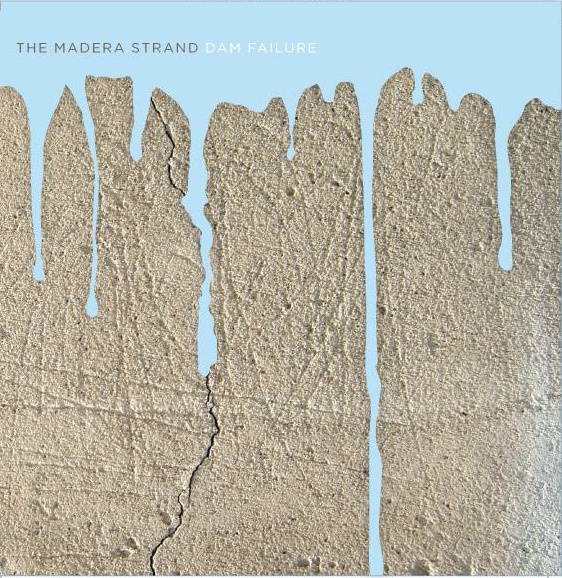 I say subconsciously, because it snuck up on me and I didn’t notice it until one night I was on the fence about a show when I found out The Madera Strand was playing and that clinched it. This month they release the three song EP Dam Failure which is a sparkling gem produced by local mastermind Bob Hoag. All three songs show in spades how far they have come since their debut– there is something in the combination of Cody Cruse’s magnificent guitar, Chris Keeling’s super-energetic bass, Dorian Demetrulias’ unreasonably enormous drumkit and percussive thunder and of course the hypnotic beauty of d’Averill Demetrulias’ voice. I remember being excited about them recording their new songs and upon hearing the three they chose I was overjoyed to discover they had picked my favorite live numbers for the EP. “Dam Failure” shows off d’Averill’s gymnastic voice like no other song. The production here is absolutely aces, accenting all the right maneuvers of every member of the band here. Listening to it for the umpteenth time I still can’t get over the guitar work and the symbiosis with the drum. And that voice. Here is a quartet with power that explores as much within the spaces of their music as they do in the music they make, what’s left out is every bit as important as what is there–that’s just sheer talent. Meanwhile “The Void” displays its beauty with the band bringing their total A-game like a perfect tapestry of sound, seriously it makes me ache it’s so good. This has been one of my favorite songs in their recent live sets and its great to hear it so expertly presented here. d’Averill’s voice has never sounded better, there is once more a gymnastic quality about it that makes her range almost incomprehensible, there’s something of a Bjork quality to it that is absolutely mesmerizing (all right let’s face it, I love this woman’s voice). Chris, Cody and Dorian provide the most amazing textural backdrop to her vocals that there is a strange contrast between the moments of light and darkness, it’s as if they have made the star filled night itself into a song. Pure beauty made into music an when it takes off at the 2:30 mark it makes my heart race every damn time–amazing. Finally, “Fields of Night” is probably my favorite song they do and the studio version is simply stunning, here it becomes something of a psychedelic variation on Portishead and it comes off perfectly–mainly because d’Av’s voice is better than Beth Gibbons any day of the week. It is a spacy contemplative number, but once more Hoag has worked his magic and not a member of the band is missed in the spotlight. It’s six and a half minutes of pure bliss to these ears and it makes me crave an entire album by The Madera Strand. Lyrically it is filled with an intrinsic yearning that you can feel in her voice and the music that surrounds it: “And so I’m made to ride, For as far as the stars are wide, This feeling will not subside, I long to be at your planet side.” Epic and brilliant at once. The only thing missing is the sample “My God its full of stars”, which I sorely miss, but luckily my mind knows where it goes, but I wish it was on the recording. I certainly hope they still include that in their live performances. Now listen below to hear what I’m talking about! 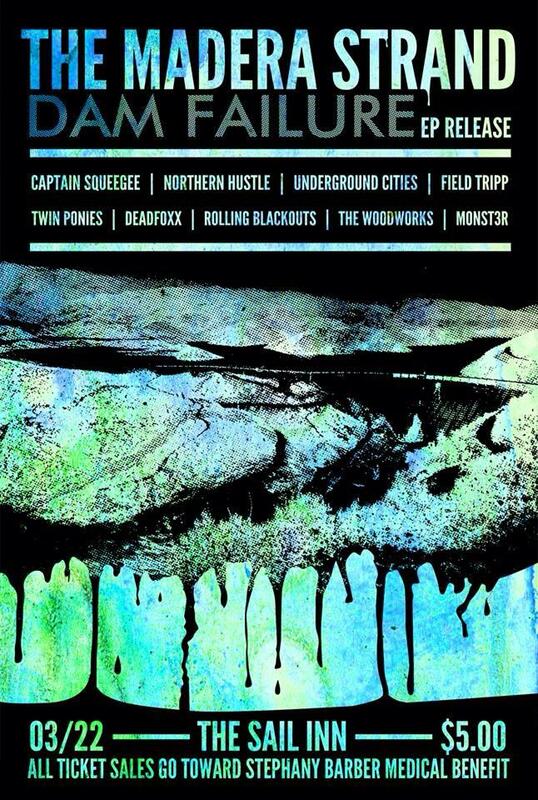 This Saturday, March 22nd they will celebrate the release of Dam Failure with some amazing company in tow at The Sail Inn with Captain Squeegee, M0NST3R, The Rolling Blackouts, The Woodworks, Field Tripp, Twin Ponies, Underground Cities, Deadfoxx and Northern Hustle. That my friends, is an amazing show that everyone should attend. I mean that lineup could not get seriously better in any capacity, the diversity of sound alone makes my ears crave this day. As we all know, the Sail Inn will be closing in June, so enjoy every show you can at this amazing venue where we have had some pretty goddamned amazing experiences. This is certain to be one of them. It’s extra important to come out to this show because all proceeds will go to help the bands dear friend Stephany Barber get the medical treatment she needs. Nothing makes you feel better than getting your groove on and knowing your doing some good at the same time! See you there!